Love Lo: April Photo A Day! Can you believe tomorrow is APRIL?!! I've been wanting to do a photo a day challenge for a long time but shoot just haven't committed to it! 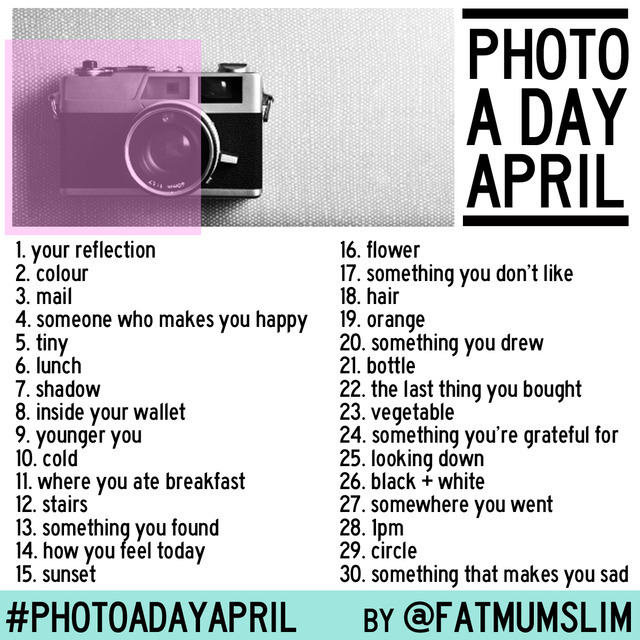 So this month I AM committing to do the above AprilPhotoADay Challenge! So if you have instagram follow me @tippeecanoe, and please join in on the fun! If you do not have instagram thats ok! (really you are missing out;) ) But seriously it's ok! Because every Sunday I am going to do link up where you can still participate and share your 7 photos of the week!! So you can join in either way!! It starts TOMORROW! so come on and get your camera on! Honestly, I've been dying to get with it in these photo a day monthly themes!!! Thanks for posting this b/c I am SO gonna try it for April!!! May the odds be in OUR favor in completing these shots!!! I want to do it too!! but i have an android, so I don't have instagram.... :( can I still play? This looks AWESOME! I would LOVE to do this!!! umm yes I would say you deserve a break! Props on doing 2 months though!! I tried to do March and did SIX days...or maybe it was 5?! Good luck with April! I need to try and do it again. thanks for the luck! I will probably need it!! Heck yes! I've seen these everywhere I am so doing this. Although I will officially being an iphone'r May 1 but still doing it :) Thanks! I am so looking forward to seeing your pictures! :) Iphone or no Iphone it will still be a blast! And then you can join in for Mays photo a day with Instagram! !